Another print I made this weekend – Key Bridge, in palladium. This is a 5×12 negative from my Canham. For the technically minded, I used a circa 1949 Kodak Commercial Ektar 12″ lens for the shot. It’s a very sharp lens with pleasant rendering, and a good match for the subject matter. I also want to talk for a second about the printing – this is a pure palladium print, with a touch of NA2 added for contrast. Sodium Platinum (NA2 for short) is a contrast agent you can add to a palladium print to boost the contrast if required. NA2 is very powerful stuff – a tiny bit goes a long way. In this case, I needed just one drop of 2.5% NA2 added to the 12 drops of Palladium and 12 drops of Ferric Oxalate sensitizer. NA2 comes from the manufacturer in a 5% strength solution, so you can see how little was needed to give the print some snap. If you are using blended platinum and palladium, or trying to do a pure platinum print, and are in need of a contrast boost, you cannot use NA2 as a contrast agent – the platinum in it binds with platinum in your paper and what ends up happening is you reduce your highlights, blowing out detail, without actually increasing contrast. If you are using a blend, or pure platinum, you have several options – you can boost the contrast with a different additive, such as gold chloride, you can pre-coat your paper with fumed silica, or you can use a dichromate infused developer. I prefer adding a contrast agent into the emulsion rather than in the developer, because to do the infused developer route, you’ll need to have six or eight bottles of developers with different concentrations of contrast agent, and then you’ll have to play with chemistry to mix up replenisher for each developer concentration as it gets used. That realistically means keeping twelve to sixteen bottles of developer around. The downside to additives to the emulsion is that most of them will alter the color of the print. Gold Chloride will do anything from slightly cooler gray tones to eggplant/aubergine tones, depending on how much of it you use. Sodium Tungstate will actually reduce contrast in the print, and give you reddish brown tones. You can use dichromate in the emulsion as an alternative to the developer, but you must be careful in handling the undeveloped print as dichromate is toxic. 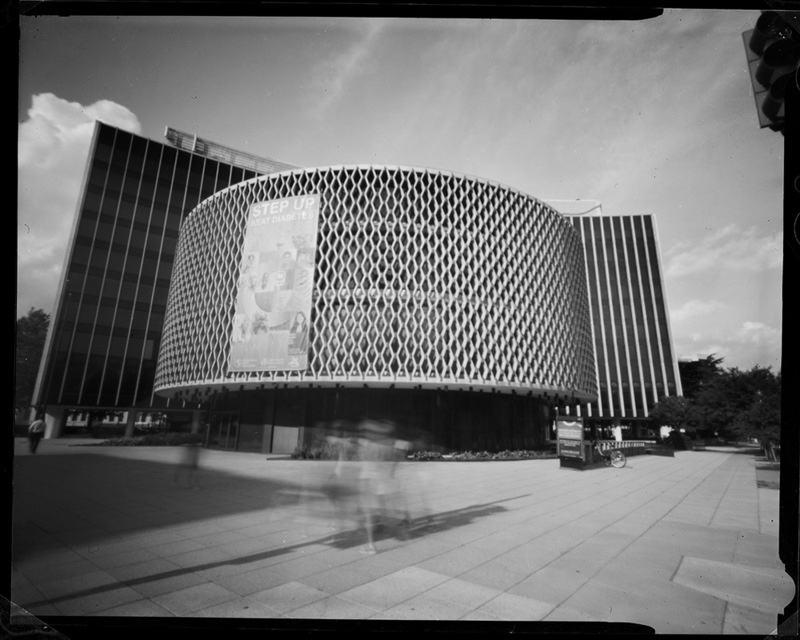 Pinhole Photography- another way to have photographic fun! Don’t worry- I’m not abandoning lensed photography with high-acutance, high-precision cameras. I love my Rolleiflex! What I am doing, though, is exploring pinhole photography and other forms of lo-fi photography (my previous post with the Lomo Belair triptychs for example). I find it quite liberating in many ways – you have to quit worrying about precision, and just make images. Live with the serendipitous. Like this first image. I’m absolutely blown away by what I pulled off with it – it’s actually a double-exposure. 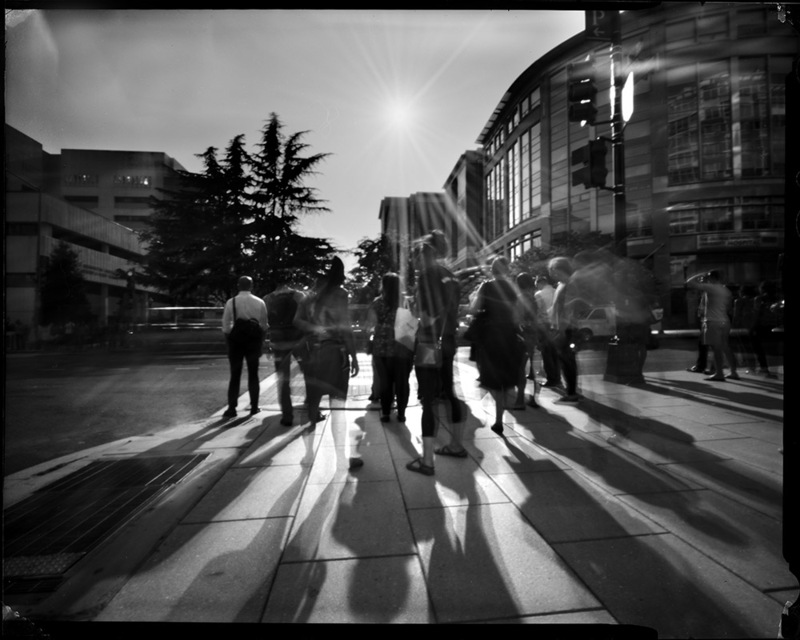 I’m going to play around more with the idea of multiple exposures on pinhole. Pinholes, although they are very slow in many ways, have some major advantages – because there is no glass to distort the image, they are absolutely rectilinear. Straight lines will always be straight lines. There’s no shutter or aperture to set with one – the pinhole is the aperture, and in the case of my pinhole camera, it’s f/208, which means that even in full sunlight I’m getting roughly 1 second – 2 seconds for exposure times. The shutter in this case is just the body cap – take it off, count one one thousand, put it back on. It doesn’t get simpler than that. Of course, this has a different downside – hand-holding exposures is not realistic, ever, unless you really really really love motion blur. I like motion blur well enough, but I like it applied selectively – I like the contrast between sharp, static and moving, blurred. I like how using long time exposures captures a third dimension to a photograph, time, that we perceive as non-existent in “typical” photography where time is condensed/extracted to 1/500th of a second. Playing with time in a camera really does in a way turn the camera into a time machine. It also shows us that our concept of time is artificial. Things exist not IN time but rather THROUGH time. Here’s a video of my friend Tracy Storer talking about the 20×24 polaroid camera. Tracy is the manager of the San Francisco 20×24 studio, and has been working with the cameras since the late 1980s in Boston and New York when Polaroid owned and operated their own studios. Chuck Close used one to take portraits of President Clinton in the Oval Office. Getting the camera in and out of the White House was quite the undertaking, as the camera and stand combined weigh over 240 lbs. When you rent the Polaroid 20×24, it includes a staffer to operate the camera for you.